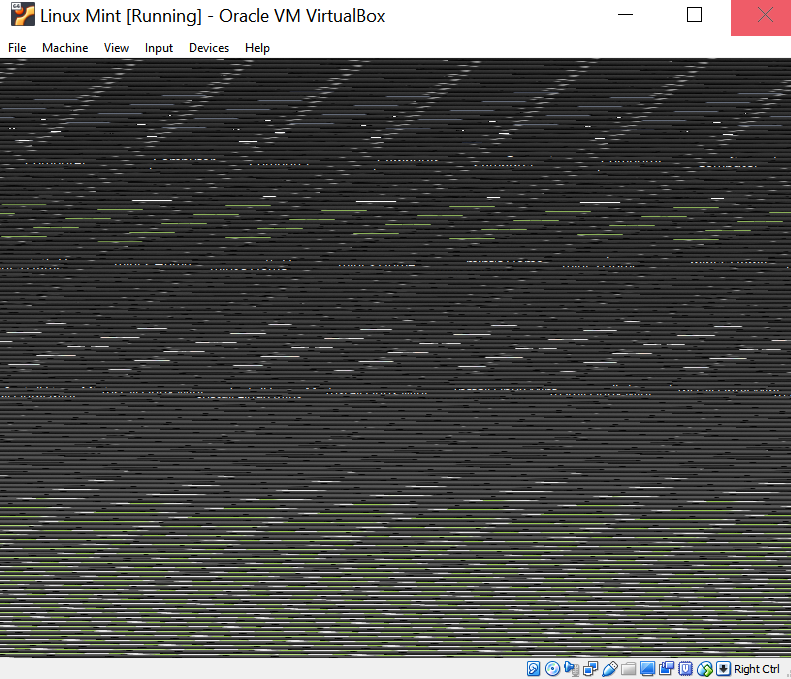 I've run into a small problem when I launch Linux Mint on Virtual Box. During bootup everything seems to be fine. Linux mint logo appears and counts down from 9 until automatic boot, during boot 2nd phase the logo appears again in b/w with loading dots beneath, but when the user interface appears, this is when I experience a fragmented image of the desktop and mouse cursor in these horizontal lines that stretch across the display. I should mention that on very rare occasion it seemed to have self corrected. Just playing around with scaling seems to be a temporary solution. Doing some research I've come across one post about a similar problem here: Linux Mint corrupted display, on first run in VirtualBox. I've tried adjusting the scale factor all the way through 200% but to no avail. I've changed my host display resolution and scale as well but this didn't seem to work either. Increased the video memory from its initial 16MB to 128MB. That didn't help either. Question 1: Am I doing something wrong? Question 2: If possible, am I able to prevent this from happening in all future uses regardless of scale? Whenever this bug appears, hold Ctrl + Alt and press F1. This will bring you to the virtual console. Then Install your virtual machine to a virtual disk image. You can also save the state of the VM in VirtualBox. This glitch occurs only when using the ISO test version of the operating system. Not the answer you're looking for? Browse other questions tagged linux-mint virtualbox virtual-machine or ask your own question. how to install the virtual-box on Linux Mint 17?